If you’ve been following this game closely, then you know in less than two weeks the game will be released! On July 28th, Bandai is releasing the Dragon Ball Super Card Game across the US and Australia. The game will be available at your local hobby game store, in the form of Galactic Battle booster packs and The Awakening Starter Decks. For the release, TCGTopTier.com is going to be doing a gameplay review. With this review, we’re going to quickly go over the rules of the game, and then talk about the gameplay aspects. Let’s get started! Speaking of rules, in order to learn how to play, we’re going to need to do a bit of reading. I highly suggest reading the included rule sheet, which is pretty clear on the rules of the game, with pictures, but lacks details on advanced timings. However, if you go online and use the advanced rule manual on the official website, you’ll find all the card timing rules; along with a complete and utter mess. If timing issues need to be clarified, go through the terrible online rule manual. Otherwise, avoid it until they have someone go through the entire thing and make it appear cleaner and easier to read. Getting on track, in the Dragon Ball Super Card Game you have two ways to win. Either force an opponent to lose all of their eight starting life or reduce their deck to zero cards (although in any of the 25+ games played, I have yet to see this victory condition). To accomplish this, you have to awaken your leader card for maximum game power, play Battle cards to attack your opponent, play Extra cards to give you added in-game benefits, and combo with cards in your hand. You do this by playing cards down as energy and using the energy as a resource to pay card costs. You then use your cards to attack the opponent’s leader card either by playing them or combing with them, which lets you use cards in your hand to boost your Leader’s or attacking/defending battle cards stats. If you’re looking for a game that just plays quickly, this game is for you. The game plays very fast and efficient. Overall, I haven’t seen a game go past turn eight, with most games ending turn five, six, or seven. Gameplay is very resource management heavy, and at times very unforgiving. You have to juggle playing cards as energy, building a board of Battle cards, using cards as combo pieces, and attacking in at the right time in the correct order, while preventing the opponent from doing the same. One card played or used in the wrong manner can quickly turn over the game to the other player. For those competitive players out there, they will find this as the challenge and appeal to the game. Playing optimally in this game can be a process based on matchup experience, setup, and draws, but one small misplay can turn the tide over to the other player very quickly. To help play optimally, you’re going to want to check out the main website for the set card list. You’ll want to be aware of the set’s card design to master playing against specific colored decks. If you do not, you may find that you’re incorrectly strategizing against the wrong decks, as playing against the different deck types requires a different thought process for each one. While the gameplay its self can be very challenging, overall the game engine doesn't stand out too much on its own. That's my biggest gripe. If you're a TCG player, you may have played this game before. It feels like a fixed version of the Naruto CCG / Dragon Ball CCG, which were also released by Bandai. At times, it can feel a little solitaire. Modern TCGs put an emphasis on alternating between players, whereas this game goes back to past CCG design. A little thing that could have made it more interactive would be alternating between the attacker and the defender to play combo cards (right now it’s all attacker's cards, then all defender's cards). The blocker keyword, which lets battle cards take over in combat as the card being attack, could have been a game mechanic to increase in-game interactions. Those two small things right there would have made the game a lot more interactive. While I am a fan of player interaction, it doesn’t kill the overall enjoyment of the game, and does increase the game’s speed – which means more games could be played in a tournament environment. 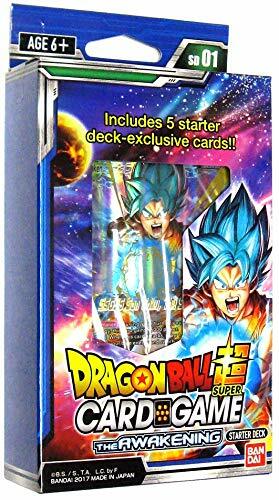 Overall, if you like Dragon Ball and/or Japanese-style collectible card games, and a game design that requires some thought to play properly, then you will find that the Dragon Ball Super Card Game is a solid product you will enjoy to master. If this is you, we’ll see you during the tournament season!